Things change very slowly in the universe, and it is tempting to think that they don't change at all. And that applies to variable star types. A Cepheid is a Cepheid. A red semi-regular variable is a red semi-regular variable. We know that our sun was once a T Tauri variable, and that it will one day be a Mira variable. But that transformation takes billions of years. Admittedly, variable star astronomers can use the so-called (O-C) method to measure the slow changes in the pulsation period that are caused by the slow evolutionary expansion or contraction of a star; this is the only way of observing the normal phases of evolution of stars. It has been applied, with great success, to Cepheids such as Polaris (Turner et al. 2005) and others (Turner et al. 2006). AAVSO observers, through their systematic long-term monitoring of pulsating and eclipsing variables, make important contributions to this process. But the period change is minuscule: it typically amounts to a few seconds per century change in a period which is several days or more. It was therefore a wonderful surprise to variable star astronomers when V725 Sgr was caught undergoing a remarkable transformation. It changed from a Population II Cepheid to a semi-regular pulsating red giant in less than a century! 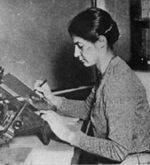 Henrietta Swope (1937) was the one responsible for identifying, analyzing, and reporting on the star's remarkable behavior. Figure 1. Henrietta Hill Swope (1902-1982) from a delightful and comprehensive history of the Maria Mitchell Observatory by Dorrit Hoffleit (2001). Henrietta Hill Swope (1902-1982) received her AB (1925) in mathematics from Barnard College, and her AM (1928) from Radcliffe College, the women's college associated with Harvard. At that time, women were not permitted to study at Harvard itself. Her "conversion" to astronomy was instigated by Margaret Harwood, Director of the Maria Mitchell Observatory on Nantucket, where Swope's family had a summer cottage. She was a research assistant at Harvard College Observatory (HCO) from 1928 to 1942. In earlier years, former HCO director E.C. Pickering had established a "tradition" of hiring women as research assistants. "Pickering's women" received lower salaries than men would have done, as was the policy at the time, so his budget went further. These women made important contributions to astronomy, and some of them are still remembered in textbooks for their work. Henrietta was the granddaughter of a president of Harvard, the daughter of a president of General Electric, and the niece of a Pulitzer Prize winning journalist, so we assume that she was not unduly exploited. During WWII, she worked at the MIT Radiation Lab, and then as a mathematician in the US Department of the Navy. She taught astronomy at Barnard College from 1947 to 1952, and then served as a research fellow at the Mt. Wilson and Palomar Observatories. She was especially known for her work in collaboration with Walter Baade. Despite her distinguished work, there is little information available about her on the Internet. The portrait in Figure 1 is taken from an article by Dorrit Hoffleit (2001). The 1m telescope at the Las Campanas Observatory of the Carnegie Institution of Washington is named after her -- not because of her work, but because she donated the funds with which the telescope was purchased. What did Swope (1937) find? V725 Sgr was one of 700 new variables discovered in a survey of Milky Way Field 187. Swope immediately recognized it as unusual, so she measured it on all available Harvard plates -- over 800 in all, spanning 1899 to 1935. 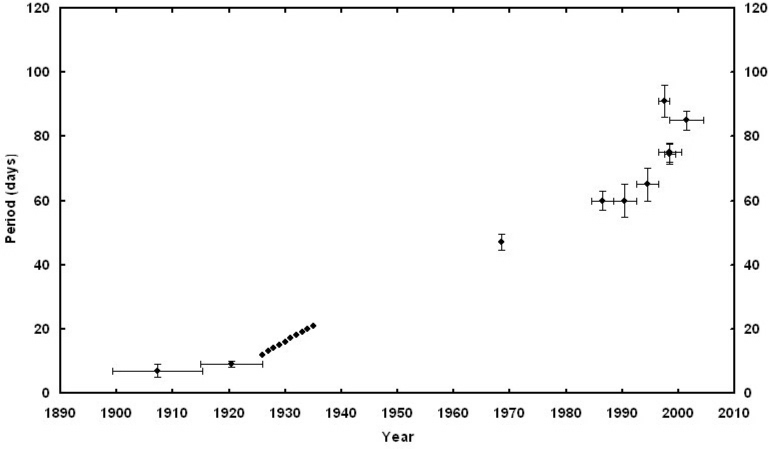 Between 1899 and 1926, the variability (if any) of this 12th-magnitude star was small and not obviously periodic. In 1926, the photographic amplitude was 0.3 and the period was 12 days. Between 1926 and 1935, the photographic amplitude exceeded one magnitude, and the period gradually and smoothly increased from 12 to 21 days. This was unprecedented behavior! For the next three decades, the star was virtually ignored. Then Serge Demers (1973) reported photoelectric observations in 1968 and 1969 which suggested that the star varied irregularly with a V amplitude of 0.4 magnitude, and a possible period of 45 to 50 days. He reported that Tsesevich had inspected Harvard plates from 1936 to 1949 and had seen very little variation, though it is not clear how accurate and reliable the measurements were. 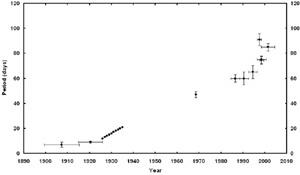 Demers also extended and systematized the study of the changing mean magnitude of the star. Demers had a special interest in Population II Cepheids; he had completed a doctoral thesis on the subject with Don Fernie at the University of Toronto. Demers and Barry Madore (1974) reported further photoelectric and photographic observations which were consistent with a period of about 50 days and an amplitude of 0.4 magnitude. There was some suggestion that the mean V magnitude of the star might be brightening: 12.59 in 1968, 12.52 in 1969, and 12.45 in 1973, but the data were few, and the secular increase was small, compared with the pulsation amplitude. But then the star languished again. AAVSO Observers to the Rescue! I was reminded about this star by my colleague Amelia Wehlau, who had once again (Wehlau et al. 1998) called attention to its remarkable behavior. It turned out that AAVSO observer Danie Overbeek, in South Africa, had been systematically observing the star, visually, since 1985. His observations continued until shortly before his death in 2001. Fortunately, Peter Williams, in Australia, began observing it in 1999, and continues to do so. Danie's colleague in Johannesburg, Hugh Lund, obtained over a year of CCD observations from 1998 to 1999. Amelia Wehlau knew that I was always looking for interesting research projects for students, and she offered the data that Danie, Peter, and Hugh had sent her. A student was available -- Anna Molak, an outstanding senior high school student in the University of Toronto Mentorship Program. She carried out the analysis. The results have recently appeared in the Publications of the Astronomical Society of the Pacific, with all of us as co-authors (Percy et al. 2006). I am delighted that Anna then went on to study physics at Amelia's university (the University of Western Ontario, in London, Ontario), and spent the summer of 2006 doing further research in the astronomy group there. 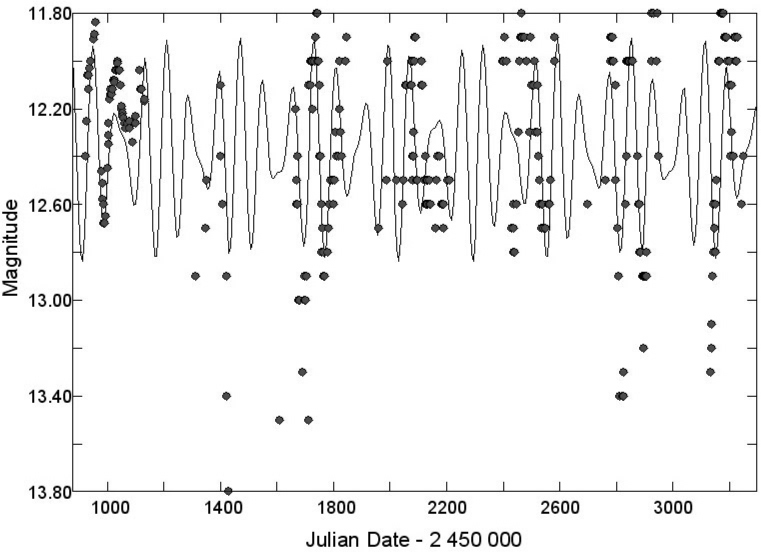 Time-series analysis is not straightforward when the period of the star is changing rapidly. Wavelet analysis would be one approach, and it would be useful to reanalyze the data with the wavelet software on the AAVSO website. We chose to use two other techniques: self-correlation analysis (Percy et al. 1993; Percy & Mohammed 2004), and the combination of Fourier analysis and least-squares fitting in the Period04 package (Lenz & Breger 2005). Inspection of the light curves, of course, is always an important first step. Self-correlation (SC) is a simple method of time-series analysis which measures the cycle-to-cycle behavior of the star, averaged over all the data. It has proven, in a series of papers (see Percy & Mohammed 2004), to be a useful adjunct to Fourier analysis. Our software is publicly available at http://www.astro.utoronto.ca/~percy/index.html. The Period04 package is also publicly available, at http://www.univie.ac.at/tops/Period04. Together with the AAVSO's TS time-series package, these provide an excellent toolkit for analysis of variable star data. 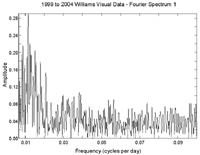 See Templeton (2004) for an excellent introduction to time-series analysis in astronomy. We began by digitizing the pre-1926 data that Swope analyzed. Between 1899 and 1926, the variability of V725 Sgr was close to the noise level, but we noted that there was a slight but consistent minimum in the self-correlation diagram at a period of 5-9 days (1899-1915) and 8-10 days (1915-1926), indicating a tendency for the star to vary on these time scales. For the data from 1922-1925, there was a clear minimum at about 9 days in the diagram. Figure 2. A two-period least-squares fit to the 1997-1998 CCD observations of V725 Sgr by Lund. The periods are 96.2 days (amplitude 0.23) and 74.0 days (amplitude 0.12). The fit is acceptable, but not perfect. The two periods may be real, or there may be a single period with irregularity and/or variable amplitude. Figure 3. 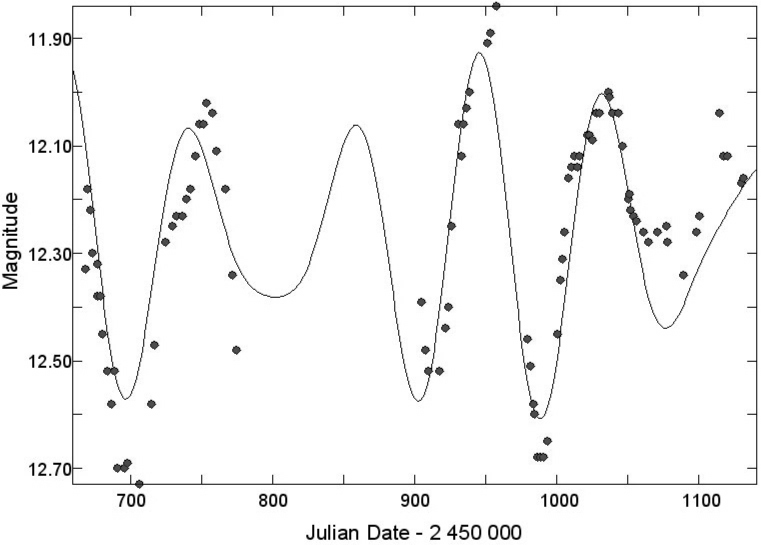 The light curve for the 1999-2004 visual observations of V725 Sgr by Williams, together with a two-period least-squares fit. The periods are 86.4 days (amplitude 0.28) and 82.1 days (amplitude 0.19 magnitude). Again, the second period may or may not be real. Figure 4. 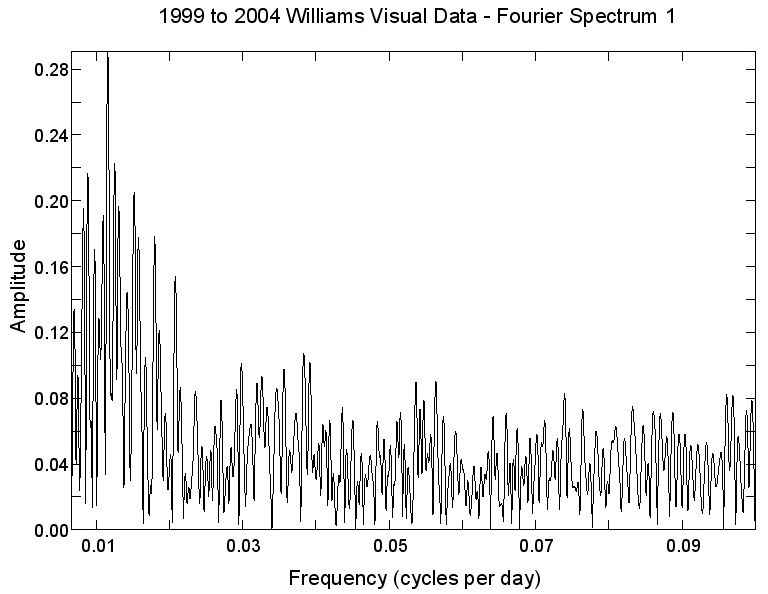 The Fourier spectrum of the 1999-2004 visual observations of V725 Sgr by Williams. Note the strong peak at a frequency of about 0.011 or about 90 days. Figure 5. The self-correlation diagram for the 1999-2004 visual observations of V725 Sgr by Williams. 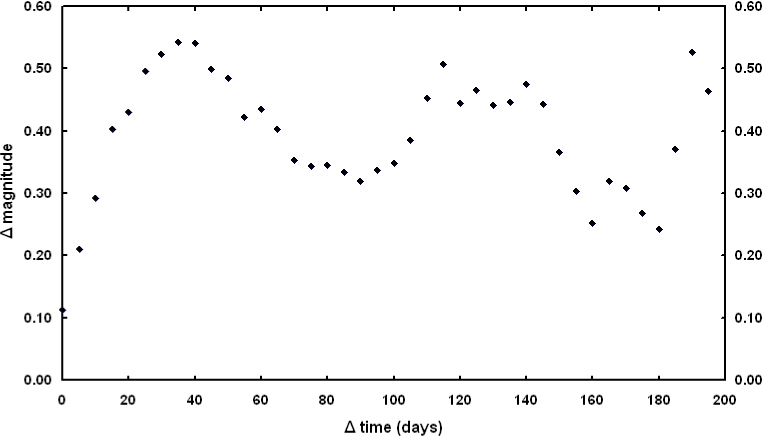 The minima at 85 and 170 days are consistent with a dominant period of about 85 days; in a self-correlation diagram, there are minima at multiples of the basic time scale. In each case, the dominant period was only semi-regular, so the uncertainties in the dominant periods are greater than the values given in the Table. Determinations of the period of V725 Sgr, with estimated error bars, versus epoch. The determinations prior to 1926 are uncertain. The figure shows our best estimate of how the dominant period has changed with time. Aside from Swope's data from 1925 to 1935, the data have been less complete than we would have preferred. But the trend is clear. The star has increased its period by an order of magnitude in a century. There is also some evidence for a gradual increase in mean visual magnitude from 12.2 in 1985-88 to 12.4 in 1999-2004 but, given the uncertainly of at least 0.1 in these means, the increase cannot be regarded as significant. The mean V magnitude in 1998-1999 was 12.30, compared with the mean value of 12.55 found by Demers (1973). This change is in the opposite sense to that of the visual observations. A look at the AAVSO on-line light curve, which is well-covered from JD 2445500 on, also suggests that any variations in mean magnitude are lost in the noise. In interpreting any apparent change in the mean magnitude, we must remember that the visual or V magnitude of a star can change because its luminosity changes, or if its temperature changes. In the latter case, a different fraction of the star's luminosity will appear in the visual or V band. At the time of discovery, the variability properties of V725 Sgr were those of a Population II Cepheid. I'm not aware that there are any direct observations of the star's composition or motion, which would confirm that it was Population II, as opposed to Population I. The Population II label is based entirely on its unstable variability. The variability properties are now those of a pulsating red giant, much like the several dozen red giants on the AAVSO Photoelectric Photometry program. Recently, Tom Lloyd Evans obtained a spectrum of the star, and confirmed that the spectrum was indeed that of a red giant. In order to understand what might account for V725's unique behavior, it is worth reviewing what is known about the nature of Population II Cepheids. Population II stars are older than the sun, and have masses similar to or less than that of the sun. They generally have lower abundances of the elements heavier than helium than the sun does. Population II Cepheids have periods of about 1 to 100 days. The short-period stars are called BL Herculis stars, the long-period stars generally have RV Tauri characteristics -- alternating deep and shallow minima. That leaves the medium-period stars, which are called W Virginis stars. You will find good articles, in the Variable Star of the Month/Season archives, on W Vir (Davis, 2003) and on the RV Tauri stars U Mon (Malatesta, 2003) and R Sct (Malatesta, 2000). All of these variable types are in advanced stages of evolution, so we should also review what is known about the structure and evolution of sun-like stars in these geriatric phases. As they exhaust the hydrogen fuel in their cores, fusing it into helium, they swell up and become red giants. 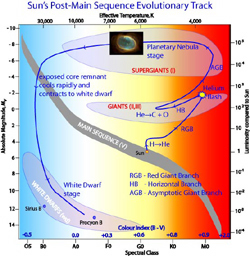 On the Hertzsprung-Russell diagram which plots luminosity or power against temperature (Figure 6), the star is said to move upward along the "giant branch" (RGB). When the temperature at the center of the core becomes high enough, the helium ignites in a "helium flash". The external results are not very dramatic. The star readjusts, contracts, and becomes a stable star fusing helium in its core, and continuing to fuse hydrogen in a thin shell around the core. On the Hertzsprung-Russell diagram, it sits on the "horizontal branch" (HB). As the star uses up its helium fuel, it again expands to become a red giant. Its path on the Hertzsprung-Russell diagram is slightly different, but gradually approaches the giant branch, so astronomers call it the "asymptotic giant branch" (AGB). The nature of the BL Herculis stars is fairly clear; they are beginning to evolve from the horizontal branch to higher luminosities and cooler temperatures. The nature of the brightest RV Tauri stars is also fairly clear: they have finished their lives as red giants, and are contracting to become hot white dwarfs. But how do the W Virginis stars get to be yellow stars? Why do they lie in the Cepheid instability strip in the Hertzsprung-Russell diagram? During the 1960's, Martin Schwarzschild, Richard Härm, and others discovered that stars that were fusing helium in a shell around a core of carbon "ash" were unstable, and underwent "helium shell flashes"; see Schwarzschild & Härm (1970), for instance. The observable result is that, for a few thousand years, the star undergoes a "blue loop" on the Hertzsprung-Russell diagram, from the asymptotic giant branch to the realm of the yellow Population II Cepheids. This phase would be a transient one, which might explain why Population II Cepheids have unstable periods -- and why AAVSO observers should therefore monitor them! One Population II Cepheid, RU Cam, actually decreased its amplitude from over a magnitude to almost zero in 1966. It was Serge Demers, in the course of his thesis work (Demers & Fernie 1966) who discovered this unprecedented behavior. Could V725 Sgr be completing a blue loop? To test this idea, we consulted the most comprehensive set of asymptotic giant branch models available, those of Vassiliadis & Wood (1993). Conveniently, the models are avialble on-line, at www.mso.anu.edu.au/~wood/ftp.html. Sure enough, the changes in the period and brightness of V725 Sgr are consistent with the end of a helium shell flash. These events are rare. We are fortunate that Henrietta Swope found this star and studied it, and that AAVSO observers continued to monitor it. V725 Sgr clearly needs to be monitored on a regular basis. So do other Population II Cepheids. For those of you with patience, the period may continue to increase dramatically in the next decade or two. Or it may not; the star may be permanently re-settled on the asymptotic-giant branch. Even then, there may be some small period change that can be detected by measuring the times of maximum brightness, and using the (O-C) method. There is also the possibility that the irregularity of V725 Sgr is actually multiperiodicity. In that case, sufficient observations may reveal a second or third period. Each period provides additional information, to compare with theory, to determine the properties and nature of this unique star. CCD observations would obviously be desirable, but visual observations are useful too, especially if they are systematic, and as complete as possible. Charts are available from the AAVSO website. The tale of V725 Sgr indicates one way, and one reason why amateurs can contribute significantly to astronomy. In this case, a survey was undertaken. One star proved to be of more than routine interest. Professionals neglected it; there are many more interesting variable stars than professional astronomers to observe them. Amateur observers came to the rescue. And the analysis was done by a bright student on the road to a scientific career. So everyone benefitted. Even larger surveys are now being undertaken, looking for gravitational microlenses, transiting exoplanets, supernovae, gamma-ray bursts, and other interesting objects. New variable stars are being discovered by the thousands, as by-products of these surveys. Among these thousands are unique variables that have much to tell us. Amateur astronomers have the time, the skill, the equipment, and the motivation to observe them. It's a win-win situation! Davis, K. 2003, "Not Your Classical Cepheid"
Demers, S. 1973, Journal of the Royal Astronomical Society of Canada, 67, 19. Demers, S. & Madore, B.F. 1974, IAU Information Bulletin on Variable Stars., 870. Hoffleit, D. 2001, Journal of the AAVSO, 30, 62. Lenz, P. & Breger, M. 2005, Communications in Asteroseismology, 146, 53. Malatesta, K. 2000, "A Favorite Among Its Class"
Malatesta, K. 2003, "At the Top of Its Class"
Percy, J.R., Molak, A., Lund, H., Overbeek, D., Wehlau, A.F. & Williams, P.F. 2006, Publications of the Astronomical Society of the Pacific, 118, 805. Percy, J.R., Ralli, J. & Sen, L.V. 1993, Publications of the Astronomical Society of the Pacific, 105, 287. Percy, J.R. & Mohammed, F. 2004, Journal of the AAVSO, 32, 9. Schwarzschild, M. & Härm, R. 1970, Astrophysical Journal, 160, 341. Swope, H. 1937, Harvard College Observatory Annals, 105, 26, 499. Templeton, M. 2004, Journal of the AAVSO, 32, 41. Turner, D.G., Savoy, J., Derrah, J., Abdel-Sabour Abdel-Latif, M., & Berdnikov, L.N. 2005, Publications of the Astronomical Society of the Pacific, 117, 207. Turner, D.G., Abdel-Sabour Abdel-Latif, M., & Berdnikov, L.N. 2006, Publications of the Astronomical Society of the Pacific, 118, 410. Wehlau, A., Atcheson, T., & Demers, S. 1998, in A Half Century of Stellar Pulsation Interpretations, ed. P.A. Bradley & J.A. Guzik, ASP Conference Series, 135, 171. Vassiliadis, E. & Wood, P.R. 1993, Astrophysical Journal, 413, 641. 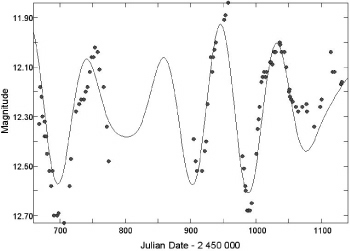 This month's Variable Star of the Season was prepared by Dr. John Percy.